When I wrote this blog post about my paternal grandfather's sister Eleda Simms in September of 2015, I lamented I didn't have a very good picture of her. My cousin Marilee recently came to the rescue with a picture from her Mom's album. The picture below that she knew was of Eleda would have been taken about 1958 and the back says "the family including myself". 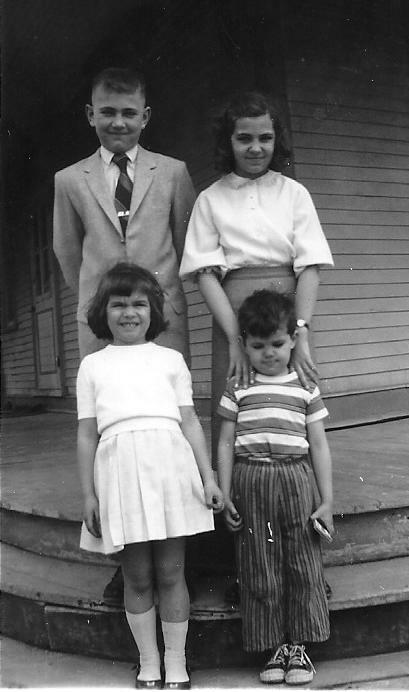 Luckily, there was a another picture taken on the same day (below) with the names of the children on the back of it naming them as Bobbie and Sandra in the back and Janice and Jimmie in front. The family tree from Aunt Dodie helped determine these were great grandchildren of Eleda's older sister Mary Bryan. Mary and Ezra Bryan's oldest daughter was Luella Agnes (1906-1996) who married a man named Benson George (1901-1983). Their only daughter Shirley (1930-2010) married William Crummy(1928-2006) in 1947 and eventually had 5 children, the older four are pictured below. 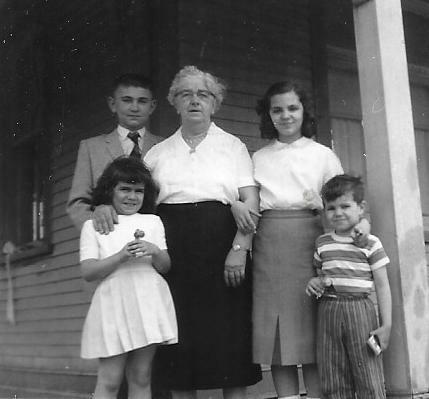 Eleda would have been about 63 years old in the picture and was likely living with the Crummy family and helping to take care of the house and the children at the time. A caretaker her whole life, Eleda died in 1973 at the age of 78 in the Ottawa area.